Serve up all your favorite hot beverages in this Choice 12 oz. white paper hot cup! From hot cocoa and coffee to tea and warm cider, this Choice cup is an economical option for your cafe, coffee shop, kiosk, or concession stand. With a poly-coated inside, this cup resists condensation accumulation to protect the outside of the cup from weakening. Featuring a tightly rolled rim, this cup provides worry-free, leak-proof drinking and creates a tight and secure seal when used with a compatible drinking lid (sold separately). Lids come off! I ordered 3 sizes and it's all of them. Was sent replacement lids but no help! They acknowledge its the cups but cannot credit or even ship back because my initial order was over 30 days ago. Thank you for the review, Jennifer. We are sorry you've experienced issues with these cups. A Customer Solutions Representative will contact you about this. I have used a lot of different disposable cups in my career. You almost always get some "rejects" in a case of cups. After a year of using these cups I have yet to find a reject in any of the 3 sizes we are using. The ECO Products lids fit really well and don't seem to leak at all. We use a rubber stamp to mark our cups and they take the ink really well. I highly recommend the Choice cups. Normally we buy Solo brand 12 ounce cups but decided that we'd try these at about 30% cheaper. Dollar for dollar, they are probably a better value than the Solo cups. Inspecting the cup, the rolled lip is very smooth, the seam is perfect, and the bottom edge is well done and textured, all comparable in quality to our Solo cups. On the inside, the coating appears to be slightly thinner than Solo's, but I've had ice water in both for the past half hour and neither are soggy. There is also visible coating on the bottom of the cup. However, we decided not to go with these cups because of the off-white color. The pure white of the Solo cups is pristine and conveys quality. If Choice could brighten the color, we would absolutely choose these, and they are still a great choice at the end of the day. This works great as a hot or a cold cup. We've had no problems with them getting soft over time and leaking. Saves you having two kinds of to go cups. These cups are okay but we've since upgraded to the biodegradable option. The white looks nice, and they're strong enough, but they require a sleeve because the heat does come through. Okay. We had a couple cups that seep out the bottom. It's very random and infrequent but when it does happen it is unexpected and problematic. Great choice for hot cups! We use these all the time at our cafe for 12oz to go drinks. We stamp our cups with our logo and these are very easy to do so. We appreciate your review, Burien. We wish these Choice paper hot cups would have worked out for you. Our Customer Solutions team has given you a credit. Not too crazy. Made in China. Really cheep stuff. Unfortunately, this is the only brand they offer unless you get recycled cups that are twice the cost. Good product. Came nicely wrapped and ready to use. We serve capuchinos here and is the perfect size. You do need a sleeve because they get too hot. Perfect cups. This is exactly what I am looking for. Very nicely designed and the quality is great. Will be using these as my main source of cups. We started out using the dart foam cups. Then we switched to these and they are awesome! We love these cups and wouldn’t want to use anything else! These cups are the same ones that other companies charge a lot more for the same quantity. Webstaurant pricing including shipping is less. I highly recommend these cups. The product was safe and it is exactly what i wanted and I love it. The Product itself is WONDERFUL. Will definitely buy them for my next party! Great quality. Easy to use and store. Appropriate for all serving and catering needs. Highly recommended. We use it for our hot beverage servings in the store. These are perfect and even better when the cup holder sleeve. I will get another size in the near future. I didn't want to start with too many sizes. Great cup that is really well made! The best part is they are so much cheaper than the cups I was using before. So happy I found these. we searched for a long time for a sturdy, economical coffee cup for church cafe and these deliver on all accounts. Great price, sturdy, look great and work great with lids #500L1020W & sleeves #500COLLAR. For the price I can't complaint. It does the job and adding the sleeves in different color makes it looks nicer depending on the season. Ordered these cups once and have not reordered. We found that after having coffee in them for a short amount of time the cup started to leak around the bottom of the cup. Nothing crazy, but always leaving a cup-ring wherever it was set down. Thought the few times it happened to me were a fluke, but it turned out to be the entire case. I mentioned it to my front line staff and they begged me not to reorder these, so I haven't. They double cupped through the case and we went back to our previous cup. Thank you for your review, Chris! We are sorry this Choice 12 oz. White Poly Paper Hot Cup - 1000/Case has not worked well for you. A Customer Solutions Representative will contact you soon! These 12 oz cups are great. I’ve bought other cups for coffee and these, by far, hold up so much better! I love the. Sleek look of pure white and the price is fantastic! These 12 oz. hot cups are perfect for serving beverages to go. At the price point the price can't be beat. I was somewhat worried we would end up with a flimsy cup, but i'm extremely impressed with the quality vs. price. used for our small hot drinks. Doesn't get soggy or leak due to the hot liquid. Outside gets warm, but not to the point where you can't hold it anymore. Our family can’t live without these! We use them to take coffee ‘to go’ every work or school day. The coordinating lids and sleeves fit perfectly. These cups a little thinner than I would like but for the value and price this is an excellent deal. it really all just depends on if you want to be a high-end coffee shop. Solid quality cup. We’ve been using this brand for years without any issues. We add our logo to the hot sleeve and save money verses buying custom cups. These are very good cups for coffee or tea. They hold a lot of liquid and seemed durable. I did not try them with the lids. Us described! Good quality and convenient set quantity. Regular staff for parties and evenings. Got it in 2 days, fast delivery. Thank you very much! Best price for a great product. We are a small business and it was a no brainer to look to webstaurant for affordable products for our business. Great cup. Durable. Perfect for hot beverages. We use with a logged stamp and it makes them look very professional! It's the only 12oz cup we use! These hot cups are very sturdy, not too thin. Perfect size for our lattes and teas. I absolutely love their white, clean look. It's easy to write on them if needed. They look great with white or black lids. These are exactly what you need for your hot beverages. We use Choice cups exclusively now and will not bother changing. They have not let us down. These are great plain paper cups for our hot drinks at great price. We have been using since our first opening and we'll keep buying it as long as the quality didn't change. These cups are very sturdy and are very nice to use when we have a hot coffee/cocoa bar. They are straight lined and appealing to the eye. These cups are perfect for all of our small coffee and hot teas to go. They fit our sleeves well and have just the right amount of room for a small. Overall good cups. A few have a messed up (thicker) rim and you cannot put a lid on them. You definitely need a sleeve with them for hot drinks. We use these cups are our "to-go" option for our coffee and hot cocoa. They hold up well, never had a leak, and look great. We have paired them with the hot sleeves and customers never complain. we always order all our paper cup. fit well with lid and perfect size for small coffee. price is also cheaper than any other place. Choice brand cups have proven to be of great quality and even a greater price. 12 oz is a good amount for my repeat customers of the day. Not too much and not too little. We bought these because they were the cheapest available. The quality is just as good as any other paper hot cups, but you can't beat the price! We love these cups. They are a regular order for us. The cup is sturdy and holds warm liquids without making the outside of the cup too hot. Solid cups. The white looks very nice (classier) compared to some of the busier graphics. I haven't put the lid on yet (haven't come yet) but these will be great with hot drinks! I don’t think these cups are anything super special but they’re great plain cups and they’re thick quality so I trust them with hot liquids. Exactly what it says it is. A sturdy cup for hot drink products. We used it for coffee and tea and the guests had no complaints. Does the trick if your not looking for anything fancy. Awesome cups! These are cheap enough that you can double cup hot drinks instead of using sleeves if needed. The paper is also great for applying a stamp or sticker if you need to. Great cups for hot chocolate and coffee. We added a sticker to the outside of them for branding and it worked great. Make sure to get lids and selves if you need them. Buy in case size to save money! Awesome cups and its a bonus that the lids used for these cups also are the same for the 20oz version. A nice plain, white paper hot cup that is great for our family get together parties. The 12 ounce cup is great for our coffee. You can't go wrong with these poly cups! They are ideal for hot drinks, but they also work great for cold beverages. They are strong and work great. We have been ordering these cups for over a year and we have never had any issues with them. They look nice and hold hot drinks really well. I used these for a hot chocolate party and they worked wonders no need to burn your hands with these cups my only regrets we're not buying enough, they are very sturdy and don't rip in the seal overall great cup. Choice makes great hot cups, especially with their brand of lids. The white on white looks very professional. I recommend using a sleeve, as the cups can get very hot on the outside, but the quality of the cups makes it worth the sleeve. Tried these cups in all sizes, all problematic. You get some that are OK, but a high number per case leak and/or the lids pop off (lids from same manufacturer). Thought it was a fluke so I kept buying them, but it was eventually apparent that every case that a problem one time or another. Had to switch to more expensive Dart/Solo brand,and it's frustrating to spend more when this is the Webstaurant recommended brand. Thank you for your review, Janice Pullicino! We are sorry this Choice 12 oz. White Poly Paper Hot Cup - 1000/Case has not worked well for you. A Customer Solutions Representative will contact you soon! Simple cup for hot coffee, tea or really any hot beverage. Is sturdy and durable. Keeps beverages hot on cold days. Works well with matching lid. The quality of the cup is decent for the great price. It’s great for hot drinks but I recommend using a sleeve because the cup on its own kind of slides of your hand. 12oz white poly paper hot cups look so nhce especially with a black lid. The quality is just outstanding. They don't melt and keep the liquids hot for a very long time. We always prefer to select white cups when serving coffee at events. The white color allows us to stamp our logo onto the side of the cup. Buying these cups on the website is much more efficient then sending someone to the store. These come in a this 12oz size as well as other sizes. This is a high quality cup that we use for our coffee and hot beverages. Doesn't leak at the seams or on the bottom and is sturdy so we are confident sending our customers out the door with their to go cup! I love the classiness of the plain white cups. They also are a blast to decorate and can write customer's drink orders on them. They look classy with the black lids. perfect paper cup size, specially for the new keriug coffee makers, they have the correct size to one fill of this makers, also the quality is really good and the heat is not an issue for this cups. This 12oz cup is solid and looks very nice. It's perfect for coffee and tea. We love the Choice line, because the lids and sleeves for this cup fit 16oz and 20oz cups too. This is my to go cup for my 10 ounce option on my Keurig! Perfect size to add cream and/or syrups! These cups keep my drinks decently warm, but nothing crazy, enough to get me to work without ending up with an ice cold coffee/tea. They are strong and durable. I have accidently left liquids sit in one all day (12+ hours) and it did not start to come apart at the seams or leak like some others i have used. Overall, this is a great deal & i will continue to use this brand! Got this cup for our "Medium" of coffee but it has come in handy for so many things. It is your basic little white cup but a good quality general use cup that can be used for hot or cold beverages. We get these cups all of the time and love them. We haven't had any issues with leaking. The only issue that has come from these cups has been due to packaging/delivery. These 12 oz poly paper cups are great for all your hot drinks! The cups are very sturdy and fit the matching lids very well! The Choice white poly paper hot cups are really great quality and very sturdy. I love the white because you can right the customers name and order for easy fixing and serving. The 12 ounce is perfect for our small size coffee. This is exactly what you would expect from 12ox white paper cups. No frills, but exactly what our store needed. Just a cup that gets the job done. These cups are sturdy and reliable. We use them daily in our shop and find them to be a great value. I have tried other cups to save money but always come back to these. Good replacement for our Dart hot cups at our coffee shop. Saves us some money per case and doesn't sacrifice quality. Sturdy cups that obviously fit Choice black lids well. We stamp on cups and never get smudged. We use for hot teas and also hot bubble tea to seal. its standard size and It fits with all of coffee sleeves and lids. If you are looking for plain hot cups, I highly recommend! These cups are excellent. They stack well for storage and they hold quite of a bit of fluid. I don't have an issue with lids not fitting. Love these paper cups. They hold hot drinks well and it still helps the cup not to get too hot. Good product and good price. Will be getting them again soon. A great plain white hot cup that is a great value. The cup is great for packaging up to go orders of potato salad or cole slaw. We serve a lot of coffee drinks at our cafe, and we have found that a 12oz cup is a great size for lattes, etc. The paper cup holds up well, and looks clean. These paper hot cups are great for both hot or cold beverages. Can be used as is or can be decorated for parties or picnics. Great value! A lot of coffee shops want to have their own branding on cups, but for us this product has been a great money saver for our little coffee shop. We like these cups but they definitely need a sleeve because they are very hot to the touch. The bright white is attractive, and you can put your business logo or design on them. Secure fit with the lids we got. We used these as to go coffee cups for a large bbq we hosted in our backyard. We'll be using them again at our wedding! Choice 12 oz. White Poly Paper Hot Cup - 1000/Case #50012W perfect cup everytime. equal or better than the more expensive. never had an issue. These white cups are great for hot drinks; it is sturdy. It's a great size and our customers love the white color; it shows it's cleanliness. These white paper hot coffee cups are a nice option for an affordable coffee cup. Eco-friendly and sturdy paper make this a nice option for any office or motel. Very affordable cup for the service it delivers! They are perfect for serving tea, coffee, and other hot beverages as well as a very sturdy choice. These are great cups. The perfect size for our coffee service that we offer at church. They hold up so well and are a great value. Great product for the price you do have to make sure the lid is on well because they fit tight and they do not remove well! You definitely don't have to worry about them falling off! Look around so the math you won't find a better priced cup anywhere. These cups are quality and the price is right catch them when they are on sale and save more. These 12 paper hot cups were ideal for my house guest to make and take their coffee with them. They are sturdy, dont leak and can be use more then once. SHOCKER!!!! We used Solo cups forever. I finally gave the Choice brand a shot and HOLY SMOKES!!!!!!! These cups are of great quality. I received no negative feedback when making the switch. These cups will save you money..... and lots of it. We ordered these disposable coffee cups for a brunch following a wedding. they worked well and were perfect for hot beverages. I would suggest the 12 oz size as the cups were not ginormous but also not too small. If people wanted more they could refill them rather than taking a lot and not drinking all of the beverage. These cups were great! Sturdy and felt like good quality. Cannot beat the price for these either. Used for our wedding along with the black lids and Kraft sleeves. Durability of choice cups are great. we have been very happy switching to a great and solid product and look forward to continuing using this product. Excellent paper cups at a great price! We use these to serve to-go coffees and teas. They're durable, and an ideal size for small/medium beverage quantities. Would recommend also getting coffee cup sleeves, to protect customers with hot drinks. This is our small cup and it is wonderful for all of our hot drinks. We never have issues with rips or tears. This is our go-to choice of cup brand. These are by far our favorite cups! You can't beat the price, there's no cheesy deign, and you can spice it up any way you want with a great coffee sleeve! The price plus custom sleeves is far cheaper than any alternative I've seen thus far! Love these white hot cups. They look sharp and easily allow me to stamp my logo on them. They have been a great addition to our cups! These cups work as expected for a hot cup. They are a good price for the quality except that the shipping charges sometimes make it cheaper to buy some locally instead. We now only carry 12 oz hot drinks in our bakery. We love this cup and the quality is great! We actually like this better than the bigger brand! Great cups! I love them! Very sturdy and love the clean look. Came in amazing shape. Heavy duty paper cups. What a nice cup from webstaurant. These cups are a great quality. I will never purchase another brand of cups because this cup really suits our needs and customers love them! We have used these cups for our church for a long time now and love them. They don't seep through, they are durable and they are a good fit in your hand. I would recommend getting sleeves for sure because the cup isn't all that thick to hold heat in. Great paper cups for hot beverages. Holds a good amount if you don't want to offer varying sized drinks. Easy to store and nice to hold. The perfect size cup for coffee and tea! We love using these at our cafe. They are simple and white, so not too distracting or busy and works well with a pretty coffee sleeve. They are of good quality and a great price, too. This is a good basic cup and one of our most popular sizes. We have had no problems with it collapsing for use in our coffee shop. I recommend this for hot drinks. These cups are excellent and they are very good quality. I love that I can have just 1 lid for all the cups. Thanks Webstrauntstore.com! We love these cups for coffee and hot chocolate. This price is great even with additional shipping. We will be using these cups from here on out! We just opened and are all paper goods at this point. We use the 8 oz, 12 oz, and 16 oz cups. The 12 oz cups are good quality but hot coffee can easily be too hot to hold in the cup. We would like to see the cup a little thicker. We do provide sleeves for our customers because of this. Also the 12 oz cups is actually 15 oz as other reviewers have noted. I plan to order the 10 oz to see if that is closer to 12 oz . Fantastic Cups! Keeps my coffee super hot and offers a nice clean look without having to spend a fortune. I reorder these cups every few months and have yet to be disappointed. i love these paper cups! These cups were simply designed, just plain white and well packaged product. Also, they are pretty good quality for the price. Great cups for a great price. We get custom sleeves for our cups. They look professional and are the best cups around for the price. This cup is really sturdy. It can last all day and I'm not finding any leaks happening it is a good size cup and is not too much. These are the only cups that I use. I checked with four (4) local vendors, and all carried similar cups... for 4 times the price! No joke! I couldn't believe it. Even with shipping, this is a much more cost effective solution. The cups always arrive within a few days of ordering. Can't beat it. These are good cups for hot drinks. They are strong and don't feel like they will collapse. I use them with hot sleeves to serve coffee, hot tea, and hot chocolate. These are a great inexpensive option for coffee shops. Every now and then there will be faulty cups, but Webstaurant has always been quick to offer replacements. This is an excellent cup. We use this in a coffee shop, serving coffee and espresso beverages. We haven't had any issues with leaking. Excellent and sturdy product. I would recommend buying a sleeve to go with it, as the heat transfers quickly to your hands. These are cups, they hold hot liquid, they are a nice canvas for drawing or coloring to waste time when you should be working. We love them and will be ordering this brand again as they are a great quality & price. These cups are a great value for those who prefer paper over styrofoam cups. I recommend using the paper sleeves for added heat resistance when using very hot beverages. We love these cups and use them in all sizes both hot and cold for our cafe. We have never had one leak or bust at the seem and they are a nice classic white. The only problem we have ever had with them is that sometimes they get roughed up in shipping so the edges of the cup are a little mashed and occasionally a lid won't fit on smoothly. That is something we are wiling to put up with for the amazing cost savings on using these cups. These are very sturdy paper cups, just as you would expect. Great for any type of hot beverage such as coffee, hot chocolate, or hot tea. These cups are great for the use! Perfect for a cup of coffee. Great use for the office! I would recommend them for any business!! I ordered these to go with theDart Solo TLB316-0004 Traveler Black Dome Hot Cup Lid with Sip Hole - 100/Pack #999TLB316 and Choice 10-20 oz. Printed Coffee Cup Sleeve / Jacket / Clutch - 50/PackItem #: 999COLLAR. They fit perfectly! You can hear and feel it pop into place when it's securely sealed. No issues with leaks (I left about 1/2" room from top of cup to help prevent leaks around the seal). These lids also work with the Royal Paper STRNPLUG-BK Stix To Go Black Beverage Plug and Stirrer - 200/Pack Item #: 999STRPLUGBK. I recommend buying the sleeves because there is some insulation, but I needed the added layer. We love these cups! They are great at holding hot beverages, we have found that you don't need a sleeve to protect your hands from the heat. You can write or draw on them. Perfect for our business. we've used these cups exclusively since we opened our coffee shop. You have to have a cup sleeve or double cup for hot drinks, they are thin but good product for the price. We use this as our small size. Best cups for the money. Beware - we had an issue with lids - not wanting to stay on the cups after they got warm. Believe it was 2 problems - 1) a bad batch of lids and 2) we tried to use Dart lids with Choice cups. Once we matched brands of cups & lids - and got rid of the bad batch (trust me - better to throw away money in lids than to upset 500 customers!!! ), we have been in good shape. There are still some issue lids, but that comes with these being a bargain brand. The cups are pretty solid. These are heavy well insulated cups. I didn't expect them to be as nice as they were. Order some lids and you're in business for some great hot drinks! These cups are very durable and strong cups. We use them in our store to serve coffee and hot chocolate. We do have to serve it with a cup sleeve because the cup gets too hot. Overall, however, I would definitely recommend these cups! Great buy for a great price. These cups are sturdy and work well for people on the move. We use these in our welcome center each Sunday morning and then they are carried throughout the church. I have not had a complaint about them yet! It took me forever to find high quality all white cups. I am using these for a coffee bar at our wedding reception, and they fit the bill perfectly! Fast shipping and great prices! Great standard cup. This is our most used cup size for our mobile coffee shop. These cups are sturdy and go well with some hot sleeves (if you are doing straight coffee or tea) and the proper sized lids. Switched to Choice brand cups. I have been very happy with the quality of the cups. The old brand would occasionally have a leaky cup and so far have not seen this problem with this brand. These 12 oz cups are perfect for my cafe. They don't leak and are sturdy! They are simple but perfect for our coffee, lattes and cappuccinos. These are great cups. I really like that I can use the same lids on different size. Make sure you have a jacket, They get hot!! This a great size hot paper cup for a medium or even a large hot coffee. It does get pretty warm, so I would recommend giving out coffee sleeves with them. This cups are the best, great size for a good cup of joe. They are sold at a great price at webstaurant.com. I recommend this product. A great white paper cup. Pretty basic but great for hot drinks. It still gets hot so you may want to get sleaves for them to keep peoples hands comfortable. These cups are the perfect to go cups. I can't stand cups with busy designs on them. Stamp your logo on these and away you go. These white paper cups are a great buy. You can easily stamp your logo on them and the clean lines look classy in any cafe. Really good, sturdy cup. We have used almost a whole case and haven't had any complaints from customers about the cup collapsing or lids not fitting well. Will definitely buy these again. We use these every day in our cafe, but don't get the lids they suggest. They fit poorly and someone is bound to get burnt. We use the ECO lids and they fit so snug it is almost hard to get off. We also brand them by stamping them and they work out great! I like these cups we use at my baby shower for hot cocoa and coffee, they're a lot stronger than they loo . Will definitely be buying them again. We love our 12oz white paper cups! They look clean, modern and elegant. People love posting photos of the latte art that we do into the paper cups. We love using the 12oz. White Poly Paper Hot Cups. They are great for our business as we put our own designed sleeve on them. They are very strong sturdy cups when coming to hot drinks. Excellent! These cups far withstand heat AND for a longer duration than most before getting soggy. Our primary use is for hit liquids such as coffee and green tea and they do the trick. We will be purchasing more as they make for great "on-the-go" travel cups as well... just need to find some lids! Love the white cups because they always look very clean and are easy to customize with sleeves and we joy note of customers specialty drink orders, which are easier to read. We use these at our Coffee shop. Good quality cups and lids fit perfect. Customers like them and they are good quality and we have had no problems with them. I use this cup for hot coffee drinks and it works well. No off taste. Strong enough. Consistent. I use them with a sleeve because they are hot to the touch with heat transfer. Lids go on securely too. We use it for coffee and hot cocoa at our bakery. Good quality and does not leak. The Choice lids we bought with this fit perfectly! Would recommend! This cup is the perfect size for a cup of coffee or hot tea. It is not too big or too small. It does get hot so it needs a sleeve. I originally orded these cups for a party I had but I will keep ordering them for everyday use. They are great for any commute. These cups are a lot thicker than I thought they would be. They are perfect for serving extra hot drinks in our coffee shop. Fast shipment and fast delivery! Good standard product. They are a perfect for my wedding. The white will add an air of professionalism to my wedding. The size is more than enough for every day use and for my event. So far so good. They are for hot food but we found them to be very economical to mix our ice cream in. They seem to hold up well and not leak. We loved the cups during my wedding! Cups were very sturdy and a nice size. Lids were very easy to go onto the paper cups. I use the Choice 12 oz. White Hot Cups in my coffeeshop, for all of my hot drinks. I used to have the Dixie brand, but switched to the Choice brand, because of the cheaper price. I do not see any difference in the cups. I have never had any problems with them, and they even work with the old lids I had leftover. I do think they need a sleeve, because they are so soft and slick on the outside. I was a little nervous at first switching to their lower cost suggestion. These have worked well for our hot tea and coffee and have held up well. We will continue to order these! We wanted a nice hot cup to compliment our coffee bar. We found that these cups worked perfectly. They are plain with no writing so they work well! These are great cups. They are sturdy and we haven't had a single leak. They are the perfect size for use with our K cup units. and they are recyclable. After using a ton of these since last August, we've had no issues whatsoever. You will want to use a cup sleeve most times. We've not had any issues with the lids not fitting but we're careful to ask folks to handle by the main part of the cup. Buying again and smaller size too for additional choices. Works great, can use it for home to events to work field. Great size and keeps the coffee warm for a little while. Will order more.Quick shipping and no damage to the product. While the WebRestaurant service/site is terrific, be wary with these cups. Probably one out of every 20 is leaking from the bottom. No visible holes so it must be something with the glue. Thank you for the review, Richard! We are pleased to provide you with superior service and low prices. A Customer Solutions Representative will be contacting you shortly to address the issues you are having with these cups. I have had a little trouble with the Choice lids staying on tight. The other sizes seem to do just fine, but the 12 ounce cups are a little loose. Great cups at half the price as the name brand. Can't tell a difference. I know, because I made the mistake of buying the name brand before. Sturdy cups. Don't leak. We use these in tandem with TLB316-0004 lids. We are constantly having issues with these cups fitting with the hot beverage lids. We have even gotten complaints from customers of the lids not staying on. Thank you for the review, Isabel! We're sorry these cups are not working well for you. A Customer Solutions Representative will be in touch with you about this. These cups are great. For the price, you cannot beat them. I have looked around, and settled on these and I am so glad I did. The 12 oz. cups are sturdy and they are exactly what I need for my coffee shop. Use the Choice 12 oz.- 1000 / Case White Poly Paper Hot Cup to serve hot darjeeling tea, which you can also get from webstaurant. There are so many uses for these cups. This is the best value we could find online for our cups! We are thrilled with the size options and will continue to use webstaurant for our bulk ordering needs! These are great disposable cups. They are durable and fit under my Keurig with no problem. The coordinating lids work well, too. I will definitely repurchase. Great product. These cups are the only ones we buy in all sizes for my busy coffee shop and we have never had an issue with them. Lids fit perfectly, and any issues we had with them were typical hot cup lid issues. Maybe 1 in 50 will have a fitting issue. Pretty good cups for the price. We've had no issues, but you can occasionally feel that some are weaker than others when pouring in hot liquid. Again, no issues so far. These cups are very well made and have a great price per unit. Customers seem to love them and they work well. Would recommend getting the heat sleeves with it because hot coffee can make cup warm quickly. Great cup! Very sturdy and a great size for a small coffee or latte. The lids fit well. They do get very hot so you definitely need the sleeves!! We love using these cups in our coffee shop. They are very sturdy so they don't bend when you hold them and they don't leak even if you have liquid in them for several hours. Purchased these cups for coffee service for our organization. Had a little trouble with some of the cups having unevenly "rolled" edges which kept the lids from adhering securely. Upon further investigation of 20 or so of the cups, it appeared that it was an issue limited to 1 or 2 of the cups on the bottom of the stack only. The rest of the cups have worked nicely and I simply check the bottom of the stacks when I restock them and remove the 1st or 2nd cup if it's uneven. Pretty basic product. Does what it's supposed to overall and is a good product for what you pay for it. The bottom of the cup fall out twice this month when we serve the hot coffee in our shop, And coffee spill all over customer's cloth. The water temperate we have is around 205 Fahrenheit. Now, we are forced to use double cup on every hot tea or drip coffee that we sell, which adds up the cost. Thank you for your review. We are very sorry the cups you received were defective. A Customer Solutions Representative will contact you shortly to make sure you are credited for the bad cups. I love these hot paper cups. They are lined with a plastic coating to keep the beverages from not soaking through even when sitting a long time. Choice has done it again with this affordable option in hot paper cups. We buy these every week and the quality meets our customers needs. These are very nice, heavy duty cups. Great for hot beverages. Be sure to get your sleeve though. The white look of these is very sleek. Have used choice cups for years of all sizes for keeping our break room stocked. The only downfall is that you cant really use them more than once or they start to come apart, so not really reusable. However, for the price its worth it and has kept us coming back. Great price, however, the quality is inconsistent. Some cups fit great with the complimenting lids, but others don't. Some cups also have a a crease in it - production error? I'm going to try another brand to see if I have better luck. Thank you for your review, Christina. We are sorry to hear that these are not fitting well with their companioned lids. We are fixing this issue for any future orders. A Customer Solutions Representative will contact you shortly. Good sturdy cup for hot drinks. We have a lot left over, but it's great since cups don't expire. I can use these for smaller parties at home since I had so many left over from my wedding reception! Great, sturdy coffee cup. We had to change coffee brands and needed a blank cup, these work great. Our old lids even fit the top, we are very happy with them. This cup is my Small size, and let me tell you, we go through them fast! But at 1000 cups per case, it's well worth the price. This is your standard, traditional cup-- excellent for hot drink like coffee and hot apple cider. Keeps the drink warm and your fingers feeling cozy. Overall great cups for the price. Be careful with the plastic bags the cups come in. They are not always strong enough to withstand one of your employees quickly grabbing it by only the top of the bag. There really is no point in going out there and buying Solo anymore. This product is the exact same and saves you money. We've only had one issue where the lids were a little off and didn't seal tight. They took care of it and sent us a free case. Can't ask for more than that... it happens! I've gone through thousands upon thousands of these cups, with no issues other than an occasional misshapen top (just a couple of cups on top of sleeve) due to handling during shipping... nothing to worry about. Stay classy with plain white. A great cup to have on hand at your cafe or bakery for hot or cold beverages. We use these at our bakery daily for customers. This is a great brilliant white coffee cup that does exactly what I want it to. Keep my coffee hot and it's a snap to put on the coffee lid. Will order again! I just wrote a review of the associated lids for these cups and gave them the same score. This review is applicable for 8, 10 & 16 oz. versions of these cups, as we have bought and have used them all. The main problem with the cups is that for whatever reason they stick together when stacked. In a fast-moving cafe/restaurant your baristas/servers need to be able to grab these couple quickly with one hand. We frequently have to use two hands to separate these at the rim. It's a small inconvenience that multiplies after a few days and after a few thousand cups. We have used comparable cups that do not have this problem, and would gladly return to them (and would be willing to pay more) if they were available on webstaurant. We have our baristas asking us daily when we're going to return to the "old" cups. Thank you for your review, Vanessa. We are sorry you did not like the cups. They are an excellent value for the price. We believe that these Dart Solo 12 oz. White Paper Hot Cups may better suit your business and reduce the problem of them sticking together. I just love these cups! I ordered them as we just began serving coffee and could not be more thrilled! Go and order them now! Th choice brand is a nice affordable alternative to the higher end "brand"name paper cups you can buy. I am all for the environment, but I am also all for my bottom line. These help! great white paper cup for all hot items. We stamp ours o brand it and the stamp color comes across well. The clean white cup looks great with the coffee jacket. These cups are very good, clear and functional too. We use these cups for coffee and tea and are perfect for that with no minus. This cups are really great, they hold all the hot drinks very well. I also am very pleased with this brand. It's the only brand use. We use the choice paper cups in three different sizes for our coffee bar. No need to search further for a sturdy, economical cup. Tight fitting kids work great, even when filled to the brim. I love that we can write on the outsides with a sharpie if we get a huge delivery order. We use the choice hot cups in three sizes in our shop. Shipping is fast and convenient and pricing is better than local sources. Highly recommended for all coffee shop needs. This is the best hot cup!!! I use this for my home gatherings/parties! They look cery elegant. I will buy this again! Highly recommended! Thanks webrestaurant! These cups are really good quality. We have tried other brands but keep coming back to these. I love the fact that they are white. The cups look great with the green eco sleeves. Love the choice products. We do have a small problem with the choice lids and small cups. The lids do not lock completely which causes leakage. Great coffee / hot beverage cups! Very sturdy for a paper cup and a good price,we use them with the black lids, We would recommend them. These paper hot cups are of great quality and are just like you would get in your local cafe. They are study and can hold for a long period of time. These cups are perfect for everyday coffee use. They are very affordable - yet a very durable and sturdy coffee cup. We love the size as well - not too small and not too big. Great price for what you get! This is a great product. No complaints about it on the staff side or customer side. They are very sturdy. We use them for hot espresso drinks, coffee, and teas. Would recommend. We use these to sell our iced coffee and couldn't be happier. They are a clean white and do a good job communicating the quality of our brand. We'll buy another case when we run out. It was time to stock up on our supplies. Never tried these 12 cups before, but the value and savings could not be ignored. I believe we ordered 100 of these cups. I like that Webstaurant has broken down their large case to provide customers with smaller requests. I will continue to use these paper cups. Sturdy. Holds well with hot products. No complaints. We love these cups! We use them for both hot and cold drinks - simple and heavy enough to not look/feel cheap, works for hot drinks but economical enough for cold, and most importantly, avoids us using plastic! We have looked at some of the eco-friendly biodegradable plastics but we have a food truck which gets too hot inside to store. For us, these are a good alternative, plus we only need to stock a single product. Great for our needs, just the right size for a to-go coffee bar. The cups also took ink well (no running or smudging) so we could personalize them for our wedding. I would absolutely order again for event or personal use. These are nice quality hot paper cups. Not like what you can buy locally. More like what you find in a nice coffee shop. The 12 oz size was perfect. Perfect clean-slate look for any modern operation. These cups are an excellent value, and great for combining with branded or decorative sleeves. The broad range of sizes keeps your image consistent. These hot cups are great. We use them for coffee and hot cider. They are the perfect size. Not too big, not too small. We only carry one size hot cup in our shop and this is it. The perfect 12 oz. hot cup. We have been going through these quickly. Very popular size and a good value for the money! Would recommend! We love these Choice White 12oz cups they are heavy weight and they allow us to add our own creative spark to our coffee shop. We hand stamp each cup which makes our cups just as unique as our shop. These white paper hot cups are very good, They hold up well to soups and coffee, and they are cheap and available in small quantities without to high of shipping. These coffee cups are a good buy for the price. Only down fall is that you must buy the lids separately and not all the lids fit perfectly t the cup with a tight seal. But they are a good plain cup. Love these cups and the plain white allows you to use your own designed sleeves to simplify the appearance without overdoing the look with business. I love these coffee cups. They are sturdy, attractive and leak proof. My clients love them and at bulk prices are cost effective, I'll never run out! Great cup, it holds up well with hot coffee and lattes, the top edge is smooth and allows for the lid to fit securely and tight! These are great. No frills, so not a lot to say, but great cup and great price. I will definitely buy again. Good choice for us! I love this product. The price is so great and affordable for a small business like we have. I will be ordering again for sure!! These hot cups are cost-effective, sturdy, and do not leak. (Very cost-effective, I’ve compared.) The white is true bright white. The lids fit perfectly as described. Happy with this choice for my business! I love using the white cups so I can use my company logo sleeve for my hot products. These are priced at a great rate. Pretty good! Nice and plain and fairly sustainable. Defiantly use sleeves with really hot beverage. The cups won't leak through like others similar in content. Definitely a step up from our previous coffee cups. We used a foam cup with a design, but was too flimsy after having hot coffee in them for several minutes. Very sturdy. Overall a great cup choice. I love these cups and they are a good deal. Not sure what else to say to make it twenty five words. They are very strong and last quite awhile. This is a nice looking cup; worked great for our event; however, we found we had to double up the ups to keep from burning hands. These cups are great! They are very durable and strong. The go great with the eco lids. Definitaly recommend these to your business or coffee shop. Perfect all purpose beverage cup. The plain white color is simple and sophisticated, and the cup itself is high quality and sturdy. We are very happy with the price. And being a small business, it helps to be able to order in smaller quantities. I highly recommend this company. They have a tremendous variaty of products that are high quality. They also have a great shipment time and varieties. These are good quality. My only complaint is they do not seem to be coated or coated much and have a paper type smell. I will get the better ones next time. 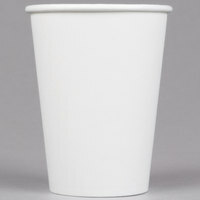 this plain white paper hot cup is perfect for my catering business. The cups are high quality and no need to double cup for coffee. The Choice 12 oz Paper Cups have been a great buy. The cups seal tight to the lids and never leak around the seams. The paper always stays dry and firm after hours of use. Great buy for our cafe. Good sturdy paper cup. Perfect size for coffee. Lid secures tightly. No sleeve needed, the cup insulates the heat well enough that the cup is comfortable to handle on its own. If you own a coffee shop. This cups are must it fits really nice and snug with hot paper black lids and completely changes the appearance of the hot beverage. Buy it from WEBstaurant you wont be disappointed. Love 'em. I use these in combination with the Choice 10, 12, 16, and 20 oz. Hot Paper Cup Travel Lid Black 100 / Pack. 12 oz. I threw my travel mugs away and use these daily. These cups work great for hot or cold beverages. A sleeve is recommended for hot beverages. Plus, with the blank cups, you can add your own logo or design. These cups work well as a 'small' size for a soda fountain. That is what we use them for and have had no trouble selling plenty of the,. The cups are of good quality and do not 'water-through' the bottom like some of the competitor's cheap paper cups will do. These cups work fine. They definitely need to be double cupped for hot coffee. The price is good, especially for those of us just starting out. I happened upon this website a couple years ago, and needless to say I have been ordering from it each year. Each year our church holds a coffeehouse event, and this website makes it very affordable! The Paper hot cups are perfect for our get together. The quantities offered, quality and price are great! These are great cups to stock up on for employee beverages because they are inexpensive and easy to dispose of! Great for a coffee shop as well!!! Switched to these paper cups from styrofoam cups and these are so much better. The customers really noticed a difference. We will not be going back to styrofoam! These are very sturdy hot cups. I initially purchased them to use while the dishwasher's on, or the morning after it's been run for a coffee-to-go cup. But I find I reach for these more and more because I just prefer these to ceramic (and I also hate dirty dishes). This size is perfect for using with a Keurig, leaving room for half&half. It's also a nice size for microwaved fudge sauce with few scoops of ice cream. They're sturdy enough to last through a whole morning of coffees. These cups are great quality and an excellent price. We love how clean they look and they look sharp with our logo stickers on them. Our most popular size of hot drink needed a cost effective and sturdy mate. We found it in the Choice line of cups after some up and down experiences with other cup lines. Perfect Choice for us! I have recently stocked up on these cups because as winter gets closer people will be loading up on the coffee. I use these with a sleeve and a lid. WebStaurant has by far the best price on these! Great coffee cups for hot drinks. Use with a "sleeve" since they're not thick enough to use without. The white works best for us. Thanks! This cup is the perfect multi-use cup. I use it for both hot coffee and cold to go drinks. I use a sleeve, nut there really is no need, It is cool to the touch. These are a standard paper coffee cup. They're unfortunately thin, so a heat sleeve is absolutely necessary. Otherwise, they're a good plain cup. We keep the design to the sleeve so the plain white is great. We have tried an number of cups in past and this has still been our favorite. These cups are priced so well and are able to withstand hot liquids for very long periods of time without loosing any integrity or leaking. Great cup! Strong and durable. It works very well with the lid and sleeve I purchased from this site too. All things shipped very quickly. Completely satisfied. I always prefer Choice cups for my coffee shop. They carry an excellent line of products. Very often its sold out and I have to use Solo (which is fine, just slightly more expensive). Good to be blank, so I can place my own logo sticker on it. It looks classy and by the way, it doesn't feel very hot even without sleeves on. When our company switched from styrofoam cups to paper hot cups, it was hard to find reasonably priced cases. I periodically check other vendor prices in the course of my ordering but have not found anywhere that beats the WEBstaurant Store price for this item.